This collection of nine graphic horror comics has two that aren’t actually horror tales in the way we usually think of them. Once again, the artists are all at the top of their form. The first comic, Ghosts from Mars, suffers from being out of date in light of what has happened with space travel since 1951. Without the reader willingly suspending belief, this one seems basic and not at all unnerving. The Gravedigger’s Tale adds weight to this volume with its story of a handsome, but absent-minded physics professor. There are twists, turns, and even humor. Return of the Ghoul, despite its unambitious title, is a thoughtful horror tale that talks to us about being frightened about what we don’t understand and find ugly. The Survivors, a science- fiction comic involving a time capsule, is elevated by its ending. The horror tale captured in Arise, O Undead Druids! Is about unsafe mines and the owner’s greed. Unconventional, unexpected elements keep it from being a typical horror story. 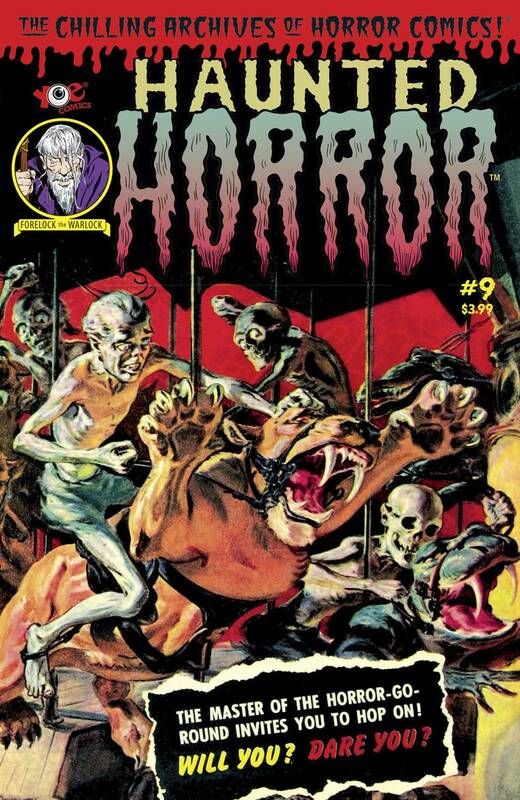 Madame Clizia in her introduction to Volume #7 of Haunted Horror comics says that Horror-Go-Round is one of her favorites. And well it should be. It is one of the strongest in this volume that represents some of the best from 1951 to 1954. This story of two brothers, an inventor, and a grotesque merry-go-round will stick in our memories. Sssshhh is an excellently illustrated black and white comic that has few words. Clumsy involves another professor and a surprise regarding who plans the evil deed. It too is a complete horror adventure. The last tale, Give The Devil his Due!! is a clever story. Saying more could spoil the enjoyment of reading it. Volume #9 has a number of comics that capture this genre well. You can order it right here.